Andrew qualified from the University of Liverpool, and joined the practice in 2011. 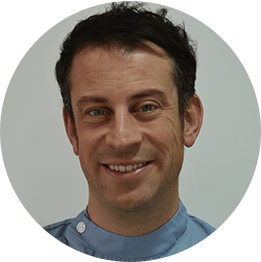 During his time with us, Andrew has established himself as a very approachable and caring dental surgeon providing high-quality treatment with a gentle approach. Andrew has a real passion for providing high quality dentistry and ensuring patients are completely satisfied with his clinical work. His special interest is in conservative treatment and periodontal treatment (treatment of gum disease). He possesses an excellent patient manner and you can be completely re assured with the treatment you receive from this highly experienced dentist. Andrew has been a Vocational Trainer since 2013, a highly respectable post which is awarded to few after a rigorous inspection of clinical and management standards.In his spare time, Andrew enjoys family life with his wife and 3 little children, football and squash.